Get AMSOIL Dealer Information here. Make money from home with your own dealership, Online registration. Amsoil Dealers get FREE shipping on qualifing orders. This Amsoil business opportunity has low start up costs and you can have with little to no inventory. 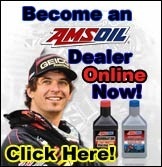 Become an Amsoil Dealer! Earn extra cash or even a full time income. Be an Amsoil Vendor and sell at conventions or events if thats something you wish to do, its all up to you. Amsoil Dealer's sell the finest quality synthetic lubricants made. Do it in your spare time, or do it full time. You will receive the absolute best support in the business to help you get started and to achieve your goals, including optional website. Request the pricing email with the RED button above to learn more!! NOTE: If you are a current Amsoil customer and would like to obtain information on a different account, please contact your servicing Dealer. They can assist you in exploring other account options that are right for you. This information is for new customers only. Amsoil and the Internet along with the excellent marketing programs has created an environment you to achieve financial freedom. By becoming an Amsoil DEALER is an excellent opportunity to advantage of the home based business scene. You will be joining a team that is committed to your success. With over 39 years experience leading the industry you have what is called a un believable opportunity to build a home business. Never before has the timing been right to Step Up To Amsoil business opportunity. Online Dealership set-up takes only 10 minutes. CLICK HERE to sign up Online as a Amsoil dealer Now! Q: After becoming an Amsoil Dealer, what business start-up costs might I expect? New Dealers are not required to make any additional purchases beyond the cost of their annual Dealer registration ($30 per year U.S). However, Amsoil recommends new Dealers purchase the Literature Kit (G1312, G8312 Can.) and/or the Business Manual (G700, G8700 Canada). The Literature Kit contains product data bulletins, price lists, application brochures and other documents that provide the information needed to begin selling Amsoil products. The Business Manual contains material that helps new Dealers learn how to sell Amsoil products, including manuals explaining how to administer the catalog program, the commercial program and the other programs through which Amsoil is sold. 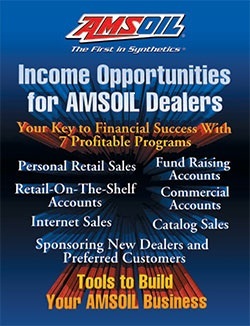 It also contains information explaining how commissions are calculated and other material that helps Dealers run an Amsoil business. Most of the information included in the Literature Kit and Business Manual is available free in the Dealer Zone. Amsoil also recommends Dealers purchase business cards and many also decide to purchase a name badge, a website (complimentary through when you sign up today with the online registration link below), product catalogs and other literature items for distribution in their first year of business. Total costs vary depending on quantities, but can easily be kept below $200. Costs of this kind are common to all new business ventures and not exclusive to becoming an Amsoil Dealer. Q: Are Amsoil Dealers required to sell products? No. Dealers only need to sell if they want to earn commissions and bonuses. Even then, Dealers are encouraged to operate their businesses according to their own goals and schedules; Amsoil does not place any pressure on its Dealers to make sales. What would you do if your current job went away? Can you spare a little time each week to increase your income? Would you like to take advantages the tax write-off's that is afforded to businesses? Do you think your current career path will ever be able to provide the financial security and personal freedom when you retire? Will your social security (if available) and your retirement provide enough to really live life after you retire? Are you satisfied with your income, your lifestyle, and the amount of free time you have? Never again will we be at the beginning of the such a transfer of wealth that is being created by the Internet Revolution. With a Amsoil home based business you're in a position to ride the entire wave. With the extraordinary opportunities currently available through a Amsoil DEALER home based business, anyone that is motivated and has the desire to succeed, some one who is coachable and willing to learn can be successful, this is for you. You will be able to control your future and achieve your dreams. By joining now you will receive FREE training and support to help you build your business. It takes a little work but the rewards are definitely worth it. Read more in the brochure. Amsoil sells its premium quality synthetic lubricants and filtration products through individuals like you. You can sell Amsoil products in your spare-time or as a full-time business. Because of the growing popularity of Amsoil, we need part time and full time Dealers in all areas! Click any of the icons below to fill out an on-line form and information will be sent you immediately. If you are not familiar with Amsoil and synthetic lubricants, please click on our home page and check out the rest of our website to learn exactly what the big oil and auto companies and your local quick lube and auto dealership don't want you to know about Amsoil products and how you can capitalize on the incredible growth of the synthetic lubricants industry with Amsoil, the worlds largest synthetic lubricants company. Amsoil is the best and most secure home based business available. For the last 35 years Amsoil has offered a rock solid business opportunity. Try to find that kind of track record with ANY other company! While tens of thousands of other income opportunity companies come and go and offer a bunch of useless hype and false claims, the Amsoil business has continued to thrive for 30 years and is continuing to grow at an unprecedented rate due to the increase in popularity of synthetic lubricants. There are many sales and compensation programs available for anyone serious about a legitimate and highly respected business with a start-up recommended package containing the Complete Training Manual, Product Literature Guide and one-year Dealership cost of $95.00 for this package. There is a nominal annual fee of $50.00 per year renewal fee after the initial registration period expires or a reduced amount if more than one year is paid in advance. All of these include a free monthly subscription to the Amsoil Action News Magazine. This an exceptionally low cost to start-up a business of this caliber. An Amsoil Dealership is a business opportunity that has been time-tested and has a proven track record of providing exceptional income to those that put forth the effort to build their businesses. Compare that to the cost of many other franchise business opportunities that require a minimum investment of $1 million dollars. In addition, as a Dealer you can get a website. We have several fully stocked warehouses and fully equipped shop facilities. This provides us with excellent knowledge of the products, equipment and the business and the ability to respond immediately to any of your needs. We will use this knowledge and experience to help you get started so you too can achieve your goals. You will also receive an extensive product, technical and training package along with other exclusive material. FREE SHIPPING on qualifying orders!! Amsoil offers special wholesale pricing for construction, industrial, farming, fleets, police as well as many other types of commercial accounts plus phenomenal savings in money, equipment longevity and less down-time. Amsoil also offers special wholesale pricing for stores and other retail on-the-shelf type businesses. You establish and service the account and Amsoil ships the products and pays you an excellent commission, plus bonuses. Amsoil offers Dealers the opportunity to own and operate their own business part or full time, establish retail and commercial accounts, establish a Dealer network and develop catalog and preferred customers in any part of the country! If you have any questions or problems with additional dealership, product, technical and business information please e-mail me. Already Know what Amsoil products you want? Maybe you would like to try the Amsoil preferred customer program first? You can always upgrade to the dealership any time you want. Amsoil Preferred Customer Program for Savvy Internet Shoppers! We all like to do better than "Retail", isn't online shopping more rewarding when it is wholesale? The preferred customer program is just that, "more rewarding". The discount ranges from 20% - 25% off regular retail prices. In fact preferred customers follow the same price list as the Amsoil dealers. > > Click Here to Get Preferred Customer Program Now and immediately get wholesale pricing! 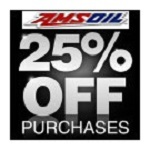 • Preferred Customers buy Amsoil products at wholesale prices (20% - 25% off). • If you buy $50 of Amsoil products a year, this program saves you money! • Preferred Customers receive an information kit on Amsoil products, an Air and Oil Filter Application Guide, and the monthly Amsoil product, racing and application magazine, the Amsoil Action News. CLICK HERE to become a Preferred Customer and purchase Amsoil products at Dealer cost. When you add the 6-month or 1-year membership to your shopping cart, you can immediately add products to your shopping cart at the discounted price along with your membership. After that, you will receive your Preferred Customer Membership pack in the mail in 7 to 10 business days. If you wish to become a dealer in the future, there will be a upgrade form in the packet to submit. Simply fill it out and send it in with a payment for the difference between a PC and a Dealer. That's it!! If you would like to contact us or have questions or feedback about our products and services, please send your request using the form below. Feel free to call with your questions. It's quick and easy to register. 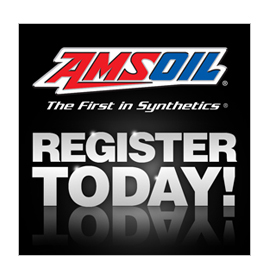 Click the link to register as a AMSOIL Preferred Customer 6 month trial membership. NO OBLIGATION TO RENEW and YOUR MEMBERSHIP WILL NOT RENEW AUTOMATICALLY!! IT'S ALL IN YOUR CONTROL AFTER THE TRIAL PERIOD IS OVER. Fill in this form for more information about becoming a dealer or Preferred customer Via email.